Bar-Tailed Godwit and Red Knot. 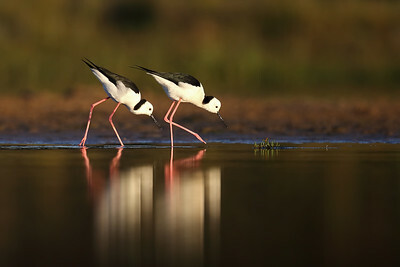 Black-winged Stilt (Himantopus himantopus) feeding. White-Headed Stilt (Himantopus leucocephalus) feeding. Little Tern (Sternula albifrons) adults in breeding plumage. 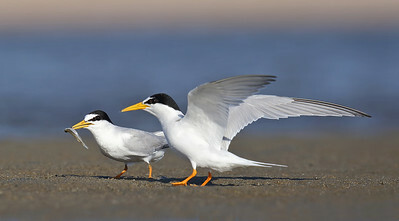 Part of the Little Tern courtship is a ritual where the male (on the right) hunts for food and gives it to his partner. This behaviour illustrates that the male can provide food for the female while she is nesting and can't feed herself, and food for the future chicks. Red-Capped Plover (Charadrius ruficapillus) female nesting. Bar-Tailed Godwit (Limosa lapponica) non- breeding plumage. Red-Necked Avoct (Recurvirostra novaehollandiae) feeding. Little Tern (Sternula albifrons) in breeding plumage taking off down the runway. Bar-Tailed Godwit (Limosa lapponica) feeding. Little Tern (Sternula albifrons) non-breeding. Bar-tailed Godwit (Limosa lapponica) non-breeding plumage having a leg & wing stretch. Little Tern (Sternula albifrons) breeding plumage preening. Bar-Tailed Godwit (Limosa lapponica) non-breeding plumage.